Oh, the thinks this guy thinks. 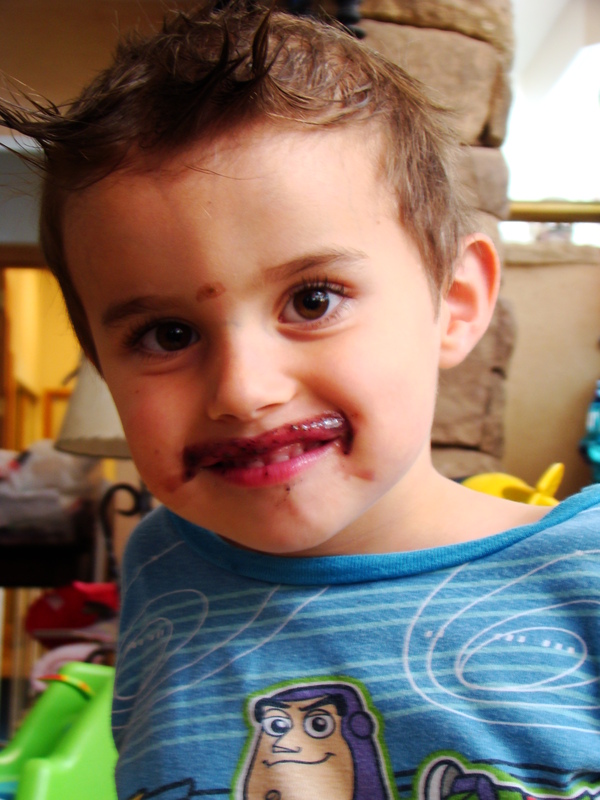 Here he is, complete with blueberry smoothie mustache, unibrow and hair gel horns (courtesy of his big sister). Upstairs. Darkened bedroom. H#3 in my arms, on his way to sleep. H#1 already asleep. She’s lying next to H#2 who, uncharacteristically, took a nap midday and is not quite ready to fall asleep. His face belies the whirring and clicking inside his brain as he ponders the great mysteries of life. He looks quizzically at the ceiling, pulls his still-to-be-relinquished-pappi out of his mouth and sits up with a sense of urgency. “MOMMY! !” he whisper-shouts before I have a chance to respond. “What sweetie?” I whisper back, somewhat annoyed that he might wake up H#3, undoing all my work to get him to sleep, which is no small feat when three hatchlings share one bedroom. Now a faint flicker of annoyance crosses his face. I’ve obviously misunderstood him. Oh, right. POSSUM cookies. Cookies. Made out of possum. You should try them; they’re a veritable delicacy here in the South. Okay, just kidding. But be honest, you were thinking it right? Now that I’ve debunked that Southern stereotype, back to my story, wherein I had no clue what H#2 was whisper-shouting about. Ahhh, possum cookies. The treats we placed in the cages we used to (humanely) catch possum and raccoons last year when they were threatening our new fowl population. These. *In my original post, I neglected to give credit to Little Debbie for the photo. My bad.